Our radical reinvention of the dress shoe unites traditional craft with modern engineering. Each innovation works harmoniously with the next, uniting lightweight and cushioned energy foam, a precision-engineered footbed, and full-motion outsole for flexibility and comfort. **NOTE** Due to the nature of leather, natural markings on this shoe may vary. Hubby loved his shoes. Look d so good with the tailored suit he had on. I’ve been a big Cole Haan supporter over the years, from the time they were owned by Nike to now with a Private Equity Ownership. I’ve always been a big fan of Cole Haan’s Leathers. They are soft, supple and durable. My recent shoe search lead me to Paul Evans, Cole Haan, and Allen Edmonds. I purchase a pair of Black and British Tan i/n these whole cuts. I love the look and styling of these by Cole Haan. Paul Evans was really the only other competitor that had a well styled whole cut. I am a big fan of Allen Edmonds craftsmanship, but I believe Cole Haan does a better job at styling shoes for modern trends. I was able to get these shoes at a great price (part of the selling point), compared to the other’s who have a $400 price point. My only suggestion to Cole Haan who is now starting to compete with Allen Edmonds and Paul Evans in higher end shoes, add Goodyear Welt construction to your high end shoes. Those who are willing to pay this much for a shoe, expect the shoe to hold up construction wise for years to come. Cement construction is a much cheaper way of constructing shoes and often doesn’t allow the shoe to be re-soled. Other than the construction, I think the leather and insole are fantastic and look forward to wearing these in and out of the office. Stunning. Received compliments daily. Runs slightly large. very easy purchase. the shoes fit well and arrived in two days. Not as good as they used to be.. They used to have exposed stitching where the leather meets the sole, that is not longer the case. For me this lessons the appearance of quality, and I like how the stitching added dimension as it was a color change. Classic look to go with new suits. Finally went on sale. These are a gift for my boyfriend. I love the look of the whole cut oxford! I always wanted a whole-cut shoe. Knowing Cole Haan's comfort, I chose these. such a popular color and style for business casual. I had the Cambridge Burgundy color shoe before and this comes close to what I like. Please bring back Burgundy color for upcoming series. A classic choice for an every day shoe that the modern man needs. The ultimate color combo to set off any suit or blue jean outfit. Yes, get the belt. They are understated and handsome. They will go perfectly with a navy suit. The quality and finish of Cole Haan shoes has always been great in my experience. I love the clean and classic look of the wholecut shoe. simplicity at its best. Beautiful shoe for dress or casual. The cut. Looking for a formal dress shoe. I enjoy Cole Haan Shoes and these will look good on my wedding day. Needed a dress shoe. Hopefully it is wide enough. Genuine leather soles help my feet breath and last forever if you take care of them. Classic Cole Haan style, this is my third generation pair on this shoe. Not cheep but worth it, I wear these every day. Looked beautiful. Seemed perfect for the wedding I was going to. I like the shoe. Would be better if the this shoe had a full leather sole and shoe was welted instead of cemented. Clean cut, truly an essential shoe. They are for my fiancee for our wedding day. What type of construction is used to make these shoes: Goodyear welt, Blake stitch, or cement method? BEST ANSWER: Cole Haan products are manufactured in the world's finest factories using the highest level of artisan craftsmanship and superior materials. Many products are handcrafted using time-honored techniques. Presently, products and materials are crafted in the United States, Italy, Brazil, Vietnam, China and India. This style was made in India. Why does this say wholecut leather when it's clearly not wholecut? Look at the stiching on the back of the shoe. BEST ANSWER: In shoemaking, the term "wholecut" refers to the entire body on the shoe being cut out of one piece of leather and having no flaps or anything stitched onto the vamp of the shoe - resulting in a very sleek, dressy look. It does not mean that there is no stitching on the shoe at all as it would be impossible to mold and shape the leather around the heel without some kind of stitching. The sole is in leather or rubber? Thanks for the reply, so will you add a rubber sole on it before you wear? Leather / hard sole. Wearing with a suit and business + holiday casual. Color and style stand out. Buy em!! Leather, with some small rubber inserts at the heel. It's leather. Can be slippery at times. Thanks for the reply, so should I add a rubber sole on it? I am going to wear/scuff mine up a bit and hope they get better, when i go to replace the sole i will most likely have them put rubber tips on it. What color shoe polish for this shoe? BEST ANSWER: British Tan shades can vary and if the color is too dark it will change the look of the shoe. We recommend using our neutral shoe cream. I have been using the Cole Haan Shine Sponge. Keeps them nice and shiny. The size for me will vary between 10-1/2and 11, depending upon the brand. How does this shoe tend to go; toward the smaller side, or toward the larger side? 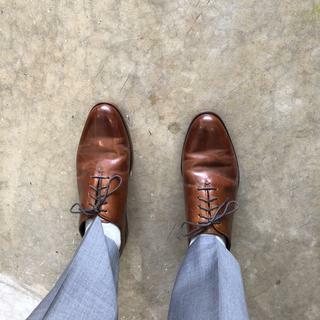 BEST ANSWER: I bought a brown and black pair of Washington Grand Wholecut Oxford and it tends to go the larger side. I found this shoe to run true to size, just be sure to select the correct width for your shoes. Runs pretty true. Mine fit as I'd expect, neither large or small. Does this sole need rubber taps? BEST ANSWER: I never used rubber taps, however if you live in a wet climate I guess you might consider adding rubber taps. These shoes are very comfortable and I don't see the need to add rubber taps.I bought a second pair in black as well. I've only worn them once and they were a-little slippery. I assumed that was due to newness. I don't think they need rubber taps, but they surely wouldn't hurt. Also, the rubber taps could extend sole life. At first a bit slippery, but after one or two wears they break in and I don't use any rubber taps! Will this shoe ever come with a leather bottom with the Grand OS cushion? BEST ANSWER: This shoe does have a leather sole which is debossed to add flexibility. The Grand OS Technology lives in the interior footbed and provides lightweight cushioning. I am still wearing a pair with leather bottoms that I purchased in 1986. Best shoes that I have ever owned. is the "Rich Leather" upper made of Full Grain Leather or Corrected Leather? BEST ANSWER: All of our leather dress shoes are made from full grain leather. Full Grain leather. A beautifully crafted shoe. For the width, there are two options, M or W. What is the differences? How do I know which one should I choose? BEST ANSWER: For Men's shoes, D = Medium Width; E = Wide; EE = Extra Wide. The difference in each width is approximately 1/4". The best way to find your accurate size is to visit a shoe store or shoe department and have your foot measured on the Brannock device. You can also check the customer Reviews tab on the product page - lots of good fit information can be found there. Can the shoe be returned to be refurbished ? BEST ANSWER: Cole Haan no longer has its own repair service, but we do recommend www.myshoehospital.com, our preferred partner for repair services. This is a fee-based service. Visit the website to learn more. what is the weight is included the box? BEST ANSWER: Weight will vary slightly by shoe size. For example, Washington Grand Wholecut in size 8 with packaging will weigh approximately 3.85 pounds. what is the shoestring length? BEST ANSWER: It is 32 inches. Can this shoe be ordered in size 14? BEST ANSWER: So sorry - this style is no longer available in 14. To see currently available styles in 14, use the drop down tabs on the men's shoe page. Is this a stitched sole of cemented sole? Are these shoes made with full grain leather? If not, what kind?